I’m a sucker for quick and easy card games and Yardmaster really fits the bill. 1-4 players vie for points in the simple set collection game with attractive minimalist artwork. Players are essentially collecting goods to load onto an appropriate cargo car and when they do that they can claim the filled car for their own freight yard. 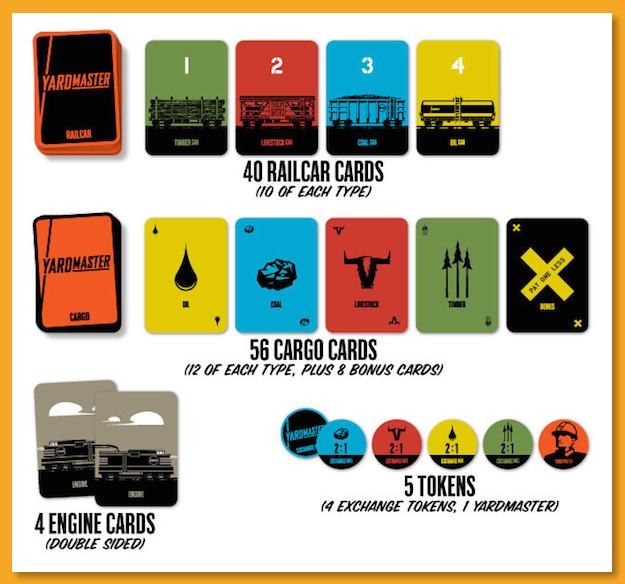 Depending on the type and value of the last card in your train, you may or not be able to attach the filled car to your train but when you do, it’s permanent and you can score the points. The first person to meet a point goal determine by the number of players wins. This game is currently up on Kickstarter and was just recently funded so give it a shot and help get the amount up to some of the nice stretch goals.